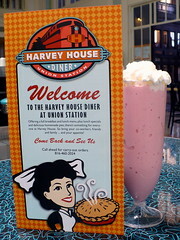 Couple of weekends ago I was sitting at the Harvey House Diner inside the almost empty Union Station, drinking a strawberry milkshake and reminiscing. Not that long ago this place was crowded with thousands of people as the second largest train station in the country, filled with sounds, voices and emotions. Today it spends it’s days quietly, ironically populated by the dead. 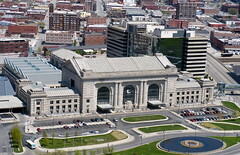 I am not old enough to remember the glory days of the Union Station but in another place and another life I rode my share of rails. There is something special about traveling by train. 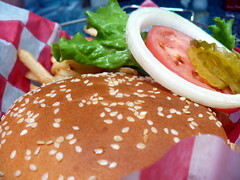 It’s an experience rather than just a means of transportation. On a long train ride you have time to relax, to think, to read, to sleep, to talk, to eat, play cards, meet people, sleep some more, and, most importantly, to look outside the window. You actually travel to your destination; you see changing landscapes; unknown places slowly pass before you; you wake up in the middle of the night at some station you’d never heard off, its sleepy inhabitants getting on the train and you can hear them walking through the rail car; you see a sunrise and then a sunset hundreds of miles later and the train keeps chugging along making that rhythmical sound that only a train can make and gently swaying from side to side. Finally you arrive, your train is greeted at the station by the sounds of a brass band and waving crowds trying to see a familiar face through the dusty window. You are tired and continue swaying even on the solid ground. A happy reunion or a new adventure awaits. that I loved and some that I didn’t, like the one to the army, or a trip to the unknown country when I left one last time, not knowing if I am ever coming back. Many times my parents or friends were there to wave good-bye or to meet me when I was coming back. I may not remember every time but I do remember the feeling, feeling of someone waiting for you. I think at least once in a lifetime everyone should travel by train, even for no other reason than to experience it. 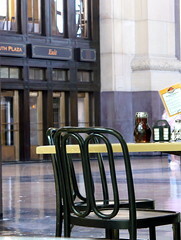 In the meantime, you can always spend a slow lunch hour at the Union Station and imagine all the hustle and bustle of the past, the tears of joy or sadness, emotionless voice of the announcer, the constant hum of the crowd, whistles of the conductors, in other words life that used to be there and and now is not.